Get a Free Tournament Entry! 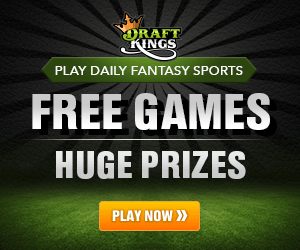 Click here to visit DraftKings! DraftKings is one of the largest online providers of short-term fantasy sports. Combined with FanDuel, it accounts for more than 90 percent of the market, and in 2014, it awarded more than $200 million in prizes from fantasy football games alone. In addition, the size and scope of the DraftKings service increased substantially in 2014 when it acquired DraftStreet and merged that client base and those services and features into its own platform. DraftKings supports new account registration through its website and through its mobile app, which is available for iPhone, iPad and Android smartphones and tablets. A DraftKings app for Windows devices is in the works but not yet released at the time of this writing. 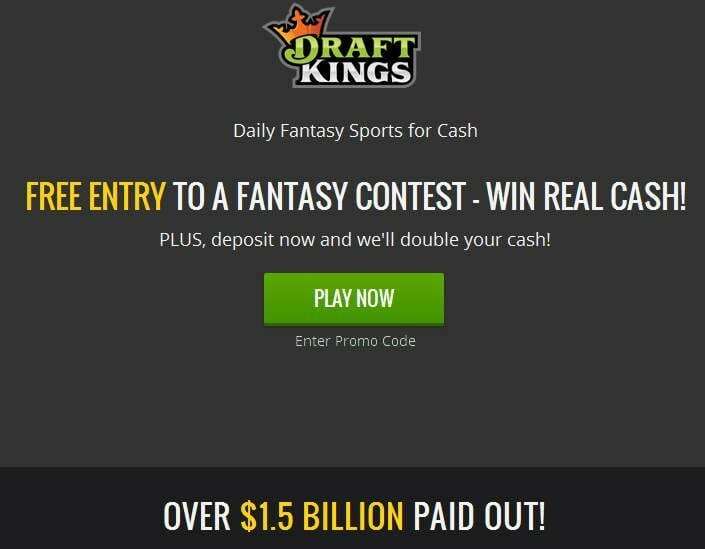 To get started, click here to visit the DraftKings website. Register your account, and be sure to enter your real personal information. DraftKings only accepts players from legal jurisdictions and uses geo-detection technology to determine your actual location. If you have problems registering an account and believe you are in a legal jurisdiction, be sure to contact DraftKings support. The site will then send a verification email, which will activate the new account. DraftKings does not require payment information to register an account. When registering your account, YOU DO NOT NEED TO ENTER ANY KIND OF PROMO CODE. All new customers receive the DraftKings welcome package. The deposit process also includes an area for entry of promotional codes, and that is where you enter codes for deposit bonuses that are available for use with established accounts. All promo codes can also be used by contacting customer support. Read our details on the Draftkings welcome bonus here. DraftKings accepts all major credit cards, debit cards, and prepaid cards for both deposit and withdrawal, including American Express, Discover, MasterCard, and Visa. Note that if you use a prepaid or gift card for deposit, any withdrawals will be refunded back to that card, so it is necessary to hold onto it even if it no longer contains funds. DraftKings also accepts PayPal and Dwolla for both deposit and withdrawal. DraftKings has a minimum deposit of $5. The service also enforces a deposit maximum for non-verified accounts. The maximum varies based on jurisdiction, and the company will remove the limit once the client faxes a photocopy of a driver’s licensed or other state/province-issued identification and an image of the front and back of any credit, debit or prepaid card used. PayPal and Dwolla users only need send proof of identification. To make a deposit, simply click on My Account and then click the deposit option. 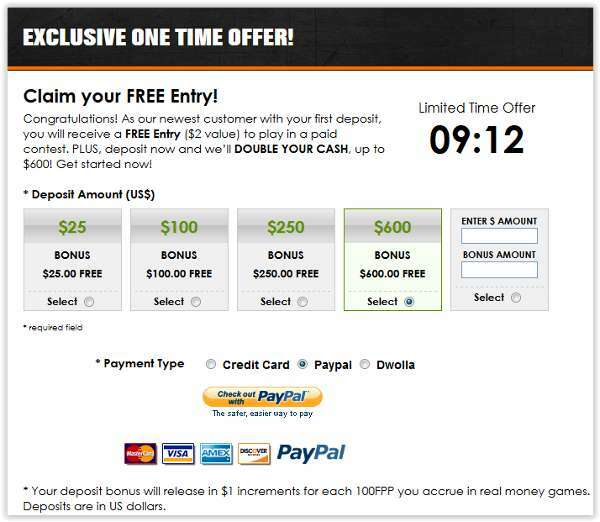 Enter the deposit amount, any applicable promo codes and then choose or enter a payment option. The deposit process will indicate any bonus amount, but note that DraftKings awards bonus dollars at a rate of $1 per 100 Frequent Player Points accrued, which are earned by joining paid contests. 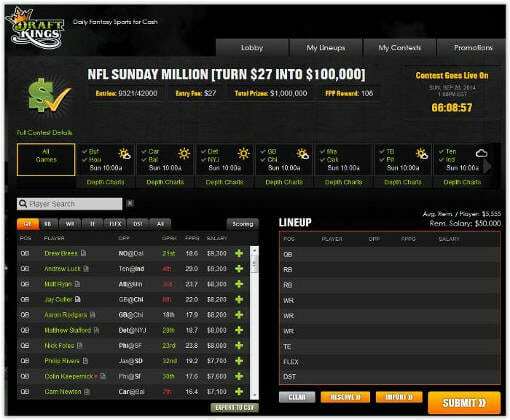 Fantasy sports at DraftKings differ from traditional fantasy sports. In a traditional fantasy football league, for instance, each player participates in a group draft, and then they use that same team throughout the year, changing it only through waiver wire pickups and trades. Leagues at DraftKings usually last only a day or a week. 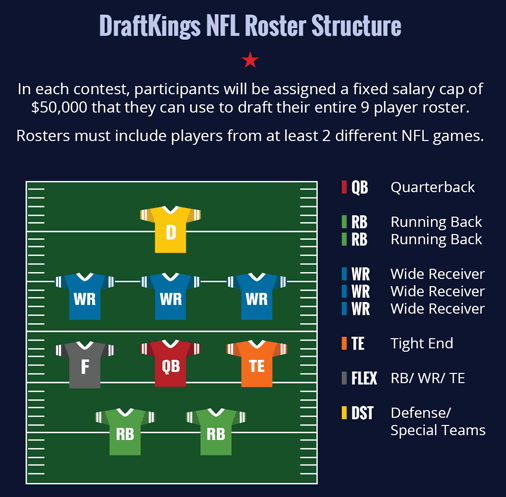 In addition, the site employs a salary cap model, which means that there is no need for an organized draft, and a player can have any athlete he or she wants as long as the athlete’s salary — as set by the DraftKings system — fits under the cap. At the end of the day or week, winners are determined, prizes are awarded and the league closes. Clients can play in multiple leagues a day or week. The DraftKings service caters to fantasy sports fans in the United States and Canada, and has recently opened up in the UK. But since the company started in North America, it places the greatest emphasis on football, and the NFL season is usually when DraftKings and the other companies in this industry reach their traffic and prize payout peaks. In addition to the NFL, DraftKings supports baseball (MLB); basketball (NBA); hockey (NHL); golf (PGA); mixed martial arts, including the UFC and other organizations; NCAA football; NCAA basketball; and soccer, including the English Premier League and the UEFA Champions League. Thousands of leagues are available each week at DraftKings during the NFL season. 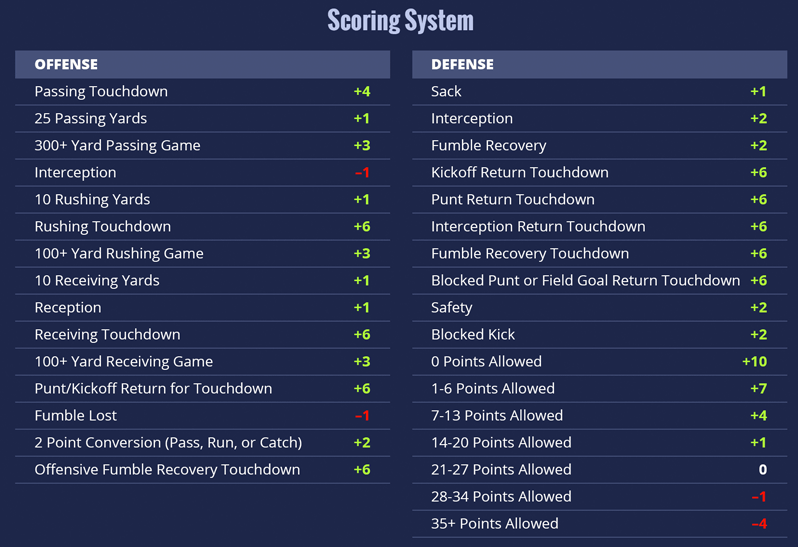 A fantasy football leagues use a standard PPR (Point Per Reception) scoring structure, including team defenses. The main difference between most leagues is the entry free, number of participants, and pay out structure. You can participate in 50/50 leagues, head-to-head leagues, large tournaments, and other formats. Each league will have a set salary cap that applies to every member. The object is to choose a roster that fits under that cap. It is rarely possible to have a star at every position, so the winning teams usually belong to the team owners who were able to find great value in a player. You have to pick 1 quarterback, 2 running backs, 3 wide receivers, 1 tight end, one flex position which can be a running back, wide receiver, or tight end, and then one team defense/special teams. You have to fill all your roster positions and do it under the $50,000 salary cap. Simply click the tab of the position and drag and drop from the left side into your lineup on the right. Once you have your lineup completed, you can enter than lineup into the contests of your choice. You can play against tens of thousands of players, or hundreds, or just a few, or just one other player – you can pick. And then your team earns points and if you place high enough in the leaderboard of your contest, you get paid! You can read detailed beginner guides on how to play fantasy football here. 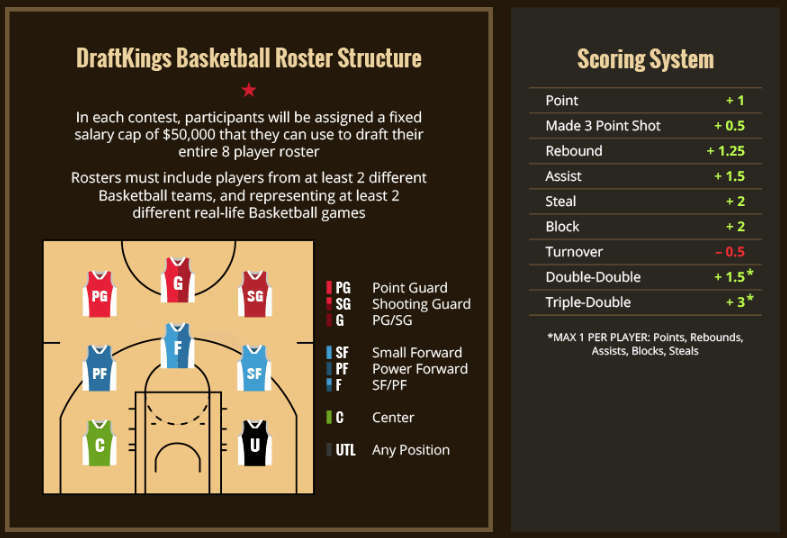 Basketball leagues at DraftKings are similar to football leagues. The biggest difference is that most leagues are daily rather than weekly. With the NFL, the most common contests are those that run the full NFL weekend from Thursday to Monday, so one has to wait until the end of Monday Night Football for a winner to be determined. With the NBA, a player can draft in the morning and then receive their league winnings at the end of the night. Note that these leagues use every game in the league that happens that day, so on Saturday, for instance, those on the West Coast need to have their rosters established before tip-off of the early game at 9am. When it comes to NCAA basketball, particularly during March Madness, leagues are often extended to account for every matchup that occurs during that round of the tournament, which means that 48- and 72-hour leagues are common. Try out DraftKings, you’ll love it! You can read more about the DraftKings bonus code here. Read a more comprehensive review of DraftKings here. Is DraftKings legit? Find out at LegitorScam.org!